The Gold Rush brought a huge influx of people eager to find their fortune among the gold fields. Most found only financial ruin. The more enterprising among them started businesses to deprive the prospectors of their money. 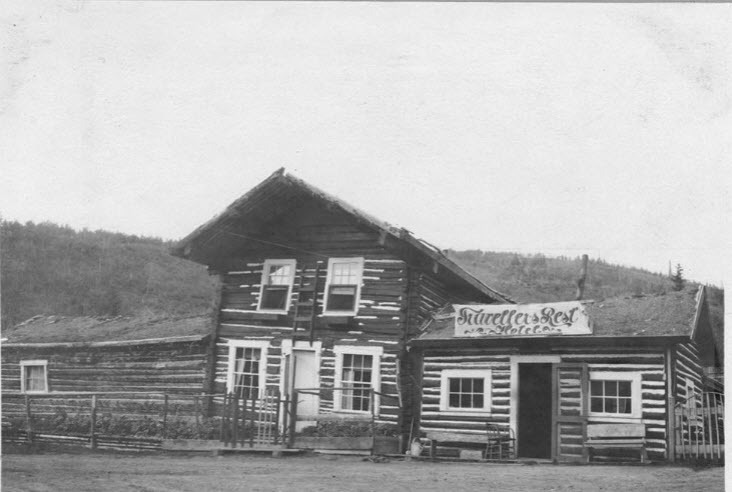 One such establishment was the Traveller’s Rest Hotel built in the town of Ester, Alaska which sprang up to service a gold mining camp. Despite its dilapidated condition, the scarcity of any accommodations other than temporary tents made hotels such as this one a magnet for the thousands of men who came to the gold fields. A hand painted sign above the door proudly proclaims that this is the Traveller’s Rest Hotel, though the slant in the floor must have made it hard not to roll out of bed. The gold rush town of Ester (now part of Fairbanks, Alaksa) sprang up from a mining camp established on Ester Creek when prospector Latham A. Jones discovered gold there in 1903. By 1907 it had a population of about 200 people and many services including a movie theater, numerous saloons, and a doctor. However the gold production soon declined and the population left as quickly as it had come.